“Mom, can you teach me how to cook?” My five-year-old son looked at me hopefully. Maybe my habit of binge-watching cooking shows had started to rub off. With our busy days, making dinner is another chance for us to spend time together as a family. That’s why we’ve partnered with Borden Cheese for the #BordenDinnerDare. They asked us to make a favorite recipe and get everyone in the family involved. 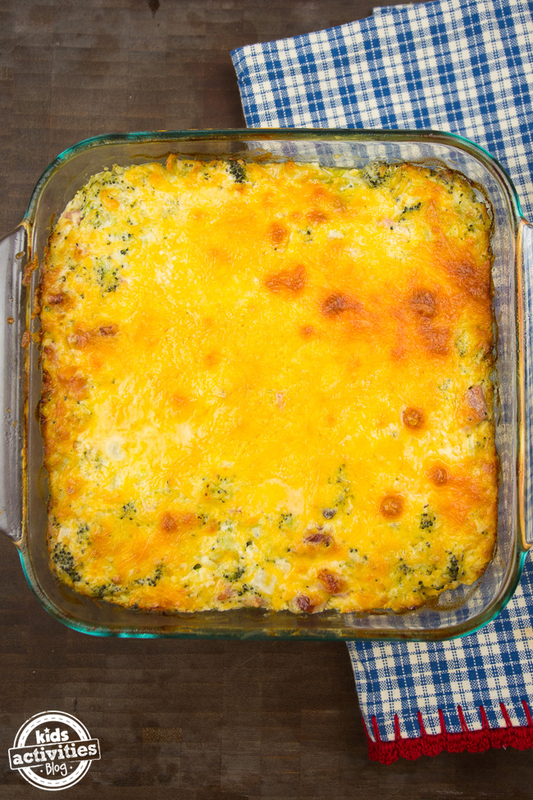 I knew immediately that I wanted to make this Cheesy Broccoli Casserole. It is so creamy and delicious. Plus, you can get kids involved by mixing ingredients, cutting vegetables and preparing the dish. Bring a pot of water to boil. Add the salt, then add the broccoli. Cook for five minutes until the broccoli is blanched. Remove the broccoli from the water and place in an ice bath. Once the broccoli has cooled, chop it into small pieces. Set aside. Older kids can help with the chopping, but since I have a little one, he mostly got to stir and sprinkle. In a large bowl, mix together the soup, mayonnaise, onion, and egg. My son loved adding all the ingredients to the bowl and stirring them together. Next comes the ham and 3/4 cup cheese. Mix in the broccoli. 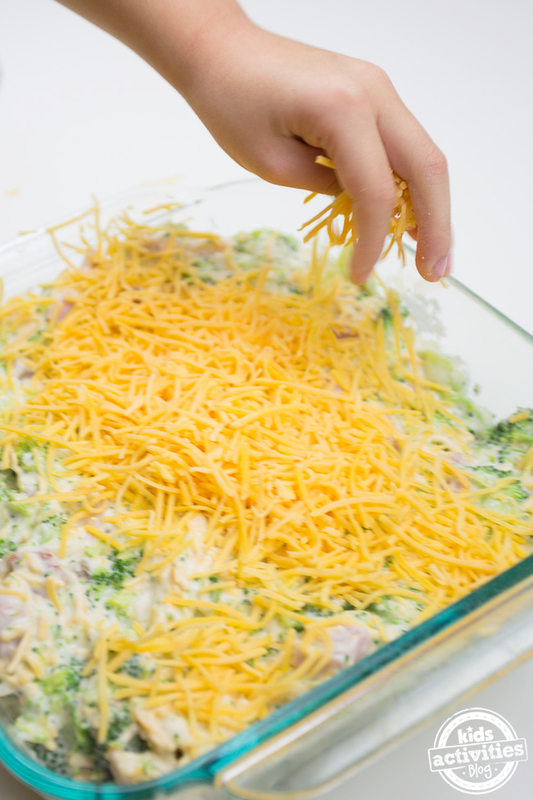 Spray an 8×8 baking dish with cooking spray and add the casserole. Sprinkle the top with the remaining cheese — this was my son’s favorite job! He *may* have sampled some of the Borden cheese as he was adding it to the casserole. Bake for 40-45 min at 350 degrees, until the cheese has turned golden brown. 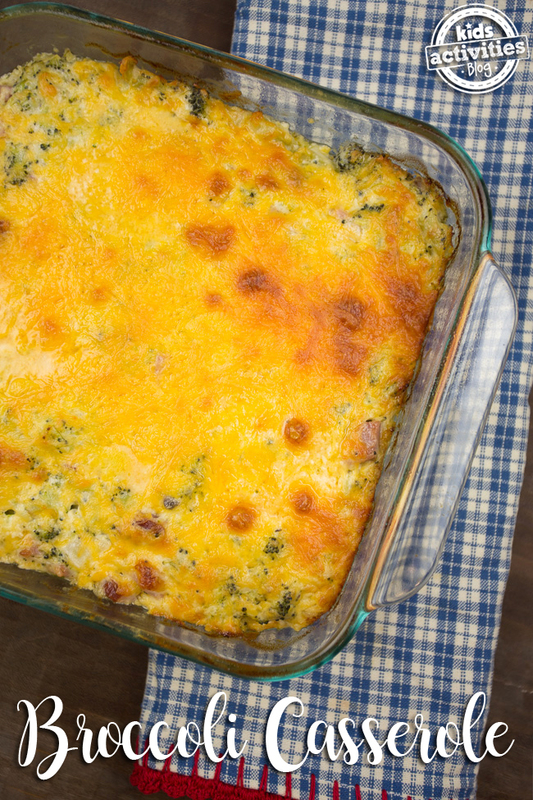 Borden Cheese is perfect for this dish — the cheesy crust on the casserole is my favorite part! For generations, Borden Cheese has been delivering wholesome dairy goodness to families across the country. Borden Cheese is not only made with pure, wholesome ingredients, but with genuine love from 8,500 American family-owned farms. We purchased our Borden Cheese at our local Albertsons. 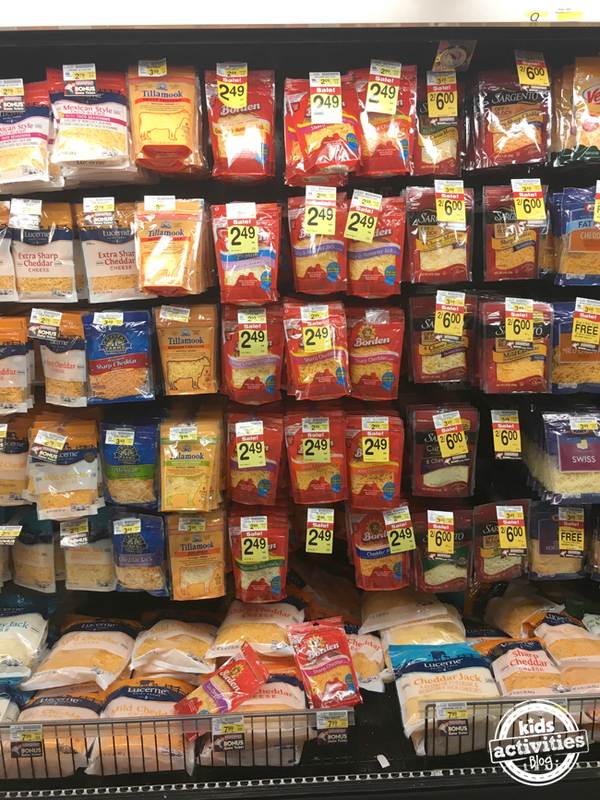 They had a large selection of shredded Borden Cheese. Are you ready to take the #BordenDinnerDare? One reader will have the chance to win a $100 Visa gift card to purchase groceries to host a family dinner of their own! 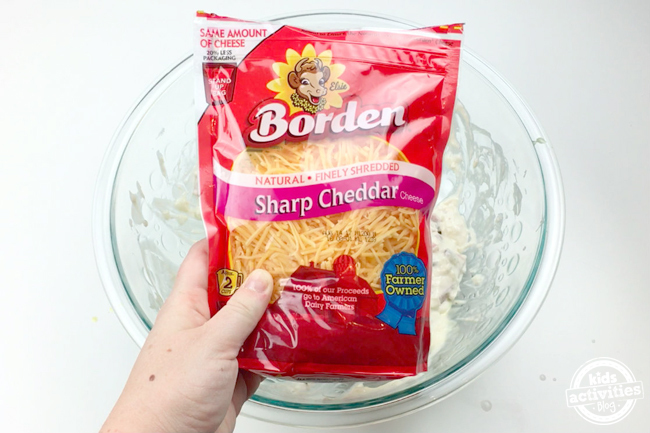 So head out to Albertsons and get some Borden Cheese to compliment your favorite family recipe. The giveaway will end at midnight on March 11 CT. A winner will be notified via email and given 48 hours to respond before a new winner will be chosen. Arena Blake used to spend her days in the White House writing about the president. Now she spends her days at the kitchen table writing about kids crafts and activities. She is the blogger behind The Nerd's Wife, a Dallas mom blog, and author of Awesome Edible Kids Crafts: 75 Super-Fun All-Natural Projects for Kids to Make and Eat. She lives in Fort Worth, Texas, with her husband and son. Follow Arena on Facebook, Twitter, or Instagram. My favorite family recipe is Lasagna. I like making creamy chicken, kale and potato pot pie. My husband loves it! My fav family recipe is ‘make your own’ pizza night, especially for pizza on the grill. You can have your own personal pizza with the fixings you want, just put them out (we grill peppers, onions, mushrooms, and more), then add the toppings, cheeses, and grill! So much fun! I love making baked macaroni and cheese. Sometimes I add spinach to make it a little healthier! Spaghetti and meatballs with red sauce is always a big hit! Our favorite dinner is baked spaghetti! My kids love breakfast for dinner, AKA Brinner! We have it at least once a week, rotating between pancakes, waffles and French toast. Most of the time I serve it with potatoes and some kind of meat, bacon or sausage. I have to say our favorite is crock pot beef roast. We love it with potatoes, carrots, onions and brown gravy. Easy and so good! My favourite family dinner recipe is beef stew! My favorite dinner recipe is meatloaf. The whole family loves it! My family loves lasagna ! Our favorite family recipe is chicken parmesan with a twist. Basically it’s chicken parm with pepperoni on top and it’s amazing! We always enjoy spaghetti with marinara sauce and a side of salad. We like baked spaghetti casserole. Our favorite family meal is spaghetti and meatballs, salad and garlic bread! My family favorite dinner recipe is macaroni and cheese with broccoli. We like to do chicken and gravy with a side of cheesy ranch potatoes. We love Chicken and dumplings! I like chicken broccoli casserole. We love to make pizza together from scratch. We love making taco in a bag! My family loves beef enchilada bake. My favorite family recipe is stuffed pasta shells. We have many favorites but Lasagna is one my husband likes often! Yum!!! I am definitely making this for Easter lunch. My family loves what we call ‘Cheese & Pasta in a Pot.’ It is like lasagna, but uses shell noodles, sour cream and LOTS of cheese! Homemade whiskey baked beans is something that I don’t make it a lot but my family would appreciate it if I did. Top this off with homemade brown bread in a can and now I will have to make this for my family although it takes a few days to make. There are so many things we like but I think one of our favorites home made spaghetti sauce that we make in the crockpot. We love baked ziti for dinner. We have several, but I love our spaghetti and meatballs! Our family loves homemade mac. and cheese. We love meatloaf! It’s something we all enjoy! I like home made pizza. It is one of thew few times when the kids can help in the kitchen and actually be helping. One of our favorites is baked chicken with potatoes, green pepper and onion. It’s so good and so easy too. My Family Loves Baked Spaghetti! Oh one of our favorites is baked ziti! I have to try your casserole, our little one loves broccoili and would really like that I think! Our favorite dinner is pork roast (made in the oven in a bag with seasoning, rice pilaf and roasted carrots. Yum! !